The centre is a safe and caring environment where every child matters. Hanna and her team has been teaching and tutoring locally since January 2005. Through this, she has developed a deep knowledge and understanding of how children learn, what makes them tick and recognises that every child learns in a different way. Her desire is to “Grow young minds”, see local children make real progress and reach their true potential and academic goals. Hanna’s aim is to provide a professional service, which offers a child-friendly and distraction-free environment for children, which is conducive to a child’s learning, but also inspires and motivates them to reach for their dreams only achieved by hard work and real commitment. She and her team ensure that learning is fun, interactive, exciting and relates to what the students are doing in school. She ensures that their educational needs are met using a variety of learning tools and motivational techniques. 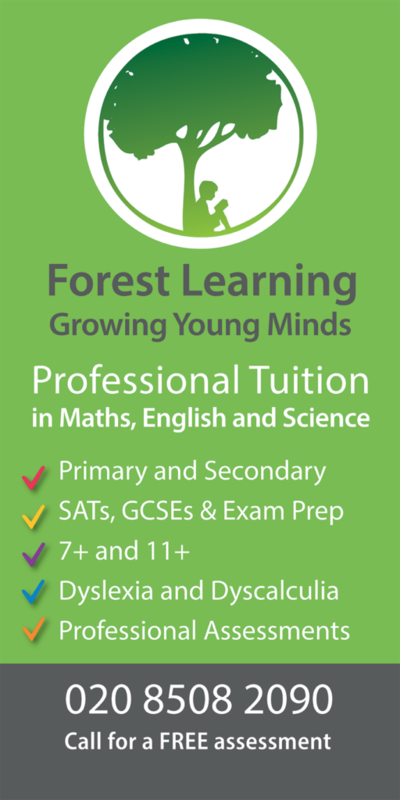 At Forest Learning, the children benefit from a huge variety of resources, learning materials and technology. All learning activities and individual plans are designed to reflect the student’s educational needs and levels and to extend their knowledge. The most up to date equipment and materials are always at hand in the well-equipped centre. Hanna and her team aims to ensure that excellent standards of teaching are maintained at all times. Hanna and her team specialises in supporting students to attain excellent results in their SATs, GCSEs as well as entrance exams; she offers support to students with special needs or fall on the cusp of needing extra help, but would not necessarily get that level of support in a state school. She recognises that the main aim of tuition is to support the students to reach their full potential by developing skill, growing knowledge, and building confidence and self-belief. Hanna is passionate about education and ensures that this is reflected in her teaching at all times. "Tuition at the centre has been one of the greatest commitment/investment that I have done for my daughter. My daughter has been going there for the past 3yrs (Year 3- Year 6) and I am pleased to say that my daughter received her results yesterday in which she obtained Greater Depth in all her SATS exams. Looking back from where she started .... she was not confident in Mathematics, from being Below Average in Maths to obtaining top marks. The lessons were tailored to my daughters needs and taking their advice on board is the most important thing to do. After every class you are given feedback which is very good. My advice to parents is start your child early if you can and don’t wait to register your child last minute when exams are approaching as most times spaces are not available. Highly recommended service . A big thank you to Erine (daughters tutor )and Hanna (Director) for all their hard work and patience with my daughter. Thank you." "Highly recommend Hanna and her team. My daughter benefitted greatly from her time at the centre, particularly improving her confidence in maths. All tutors were great, genuinely having the students best interests at heart, taking the time needed to make sure things were understood whilst encouraging students to meet their full potential. 5 stars!" "Both of my children have had excellent results from tuition. The staff is really encouraging and supportive and Hanna is honest and full of advice." "The staff is lovely and really encourage the children. I would strongly recommend."